Every February my aunt would come and stay with us, breaking her journey on her way to Newcastle-upon-Tyne to see the Royal Shakespeare Company. Usually she came with her friend Nessa, ‘my theatre companion,’ as she called her. I liked Nessa. She was dark and tiny with bright eyes like a bird. She was a French teacher and she used to help me with my homework. But one year, Aunt Bron came alone. Nessa was ill with bronchitis. Aunt Bron walked round the room while she talked. She was tall and gangly, like my father, her brother. They were the same height, so they said, but she always looked taller than him. They were like the geranium plants on the hall windowsill, one straight and strong-stemmed, the other needing staked to keep it from flopping over. Aunt Bron stopped pacing and leaned against the kitchen door as she made her suggestion. ‘Of course she’s not,’ said Aunt Bron briskly, in the way that made my father return to sipping tea and saying nothing. ‘Wouldn’t you like to go, Janet?’ she encouraged me. ‘Yes please,’ I said, avoiding my mother’s eyes. ‘Dens of iniquity,’ she muttered, and went through to the kitchen, clattering plates. Then she stuck her head through the hatch. ‘I don’t want her getting ideas,’ she said. Later, when my aunt had gone out for a walk, and I was supposed to be doing my homework, I stood outside the dining-room door and listened to my parents arguing. It was like the time my mother wouldn’t let me go to the pictures because it was sinful and a fleapit as well, so I’d be sure to catch something. 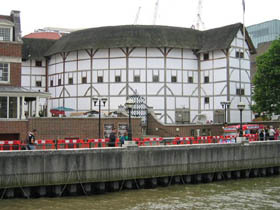 But surely the Royal Shakespeare Company wouldn’t do a play in a fleapit? ‘One thing leads to another,’ said my mother, ominously. I crept upstairs and prayed very hard that I would be allowed to go. Something must have happened in the night, for by the morning it had been agreed that I was to be my aunt’s theatre companion. I was to be Nessa for the day. I was to wear my best Sunday dress and my polished shoes and my good wool coat. ‘Ready?’ asked Aunt Bron, coming downstairs. We were leaving in plenty of time so we’d be able to fit in lunch before the matinee. We walked through the park to the station. The sun was shining on the wet grass, and the crocuses were coming out. Aunt Bron stopped and rummaged in her bag. ‘The loveliest addiction in the world,’ she said, smiling down at me. ‘A sad tale’s best for winter,‘ she said, looking out of the window at the blue sea and white gulls swooping over the cliffs. Then she began: ‘Once there was a king and a queen…’ But half-way through the story she stopped. ‘Better to be surprised,’ she said. I was pleased because it was as if she’d forgotten that I didn’t drink coffee yet: today I was being Nessa, her theatre companion. It was lunchtime when we got to Newcastle, so we found a café near the theatre. It had posters on the walls from old films, and Aunt Bron pointed out all the ones she’d seen. I thought of all the flea-pits she must have sat in. I was too excited to eat much lunch, even though Aunt Bron said I could choose anything. She had a pickled herring salad. Then she ordered a glass of red wine. I couldn’t stop looking at it, because it was so red, it was like the ruby on my granny’s brooch, or the drop of blood when you pricked your thumb. I’d never seen real wine before, only the communion wine, which was grape juice because of the dangers of intoxication. ‘Do you want a sip?’ asked Aunt Bron, seeing me staring. So I took a sip, wondering if something strange might happen to me, like communion only the opposite because this was sinful. But I felt just the same, except for the strange new taste on my tongue. We finished our lunch and went into the theatre. The floor had deep soft carpets that made you want to tiptoe and whisper. We bought two programmes, one for Nessa and one for me to keep as a souvenir. Everything in the play was blue and silver and sparkling. The queen was like the ice maiden in the pantomime, her dress shimmering in the coloured lights. There was a forest made of white branches, and snow fell, gently and magically, as if there were really clouds above the stage. In the interval we both had choc ices. ‘Enjoying it?’ asked Aunt Bron. Did she mean the play or the ice cream? I nodded yes to both. ‘Good,’ she said, and she talked to me about the play, to make sure I knew what was happening, and little fragments of it came from her lips, Why then the world and all that’s in ‘t is nothing, The covering sky is nothing and If I prove honey-mouthed, let my tongue blister and I am a feather for each wind that blows and I decided that I would learn Shakespeare too, because nothing was as beautiful as these words and the lights and the silver and the fairy-tale stage, and it took my breath away, like the first cold bite of ice cream on my teeth. When the lights went on at the end, we clapped until our hands were sore. I looked at my aunt and saw that her eyes were full of tears. We stood up and slowly put on our coats, and were almost the last people to leave the theatre. Aunt Bron hugged me. On our way we passed the market where the stall-holders were just closing up for the day. ‘I’ll get some flowers for Nessa,’ Aunt Bron said. She bought an enormous bunchful of narcissi, and I carried it for her, my arms stretching out from the too-short sleeves of my good wool coat. Just as we reached the tea-shop, there was a rush of starlings swooping over the rooftops, making dark clusters as they flew together, then fanning out again, up into the twilight-blue sky. We stood gazing up at them, and then, together, we looked down and buried our noses in the smell of narcissi. It’s dusk and I’m having tea with them in the tea-shop. Aunt Bron says, ‘I’ll be mother,’ and pours from a china pot. We have just seen Measure for Measure. ‘Wasn’t it wonderful?’ says Nessa, leaning back in her chair and sighing happily. Nessa nods. We are all silent for a moment, and it seems as though there’s a pool of light laid over our table, so that we are all three enclosed in a lamp-glow of happiness. After a little while, Aunt Bron takes a scone and spreads it thickly with butter and jam. ‘Ah, but Janet, do your remember The Winter’s Tale?’ she says, and her eyes light up like they did then, and her old creased face is lined with smiles. She asks me this every year, and of course I always remember. It’s as though they like to test me, to see if I come up with the same things every year. Then when I do, they glance at one another and nod. ‘The narcissi,’ they’ll say, or ‘The red wine!’ or, softly, ‘The snow falling…’ Every year these bits of the story are there, and every year we taste them, along with the scones and the raspberry jam. So I tell them all the parts, the sparkling grass and the blue of the sea, the soft carpets and the programme that I still have somewhere, and the fair-haired shepherd-boy kissing Perdita the lost daughter. The blue and the silver, and the moment when the statue walks and is not the statue but the queen herself (Would you not deem it breathed? and that these veins Did verily bear blood? says Aunt Bron under her breath) and I gasped, and afterwards was so glad Aunt Bron hadn’t told me the whole story. And how the king cries out, Stars, stars, And all eyes else dead coals! which was the line I’d whispered to myself all the way home on the train in the dark. ‘Wasn’t I there?’ says Nessa, a little confused, for she has heard us tell the tale so many times, and these past few years her memory hasn’t been so good. ‘Then I’m glad,’ says Nessa, smiling at me. ‘ – did gently kiss the trees And they did make no noise…‘ I finish for her. ‘One thing leads to another,’ I say, warningly, in my mother’s voice, and we all giggle like schoolgirls. Aunt Bron tops up the tea with more hot water. She fills my cup, and I glance out of the tea-shop window, and there are the starlings beginning to gather, the way they always do, in the fading light of dusk. 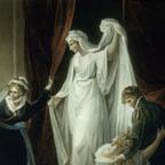 Photograph of the Globe by Kudoskid; Detail of painting from William Hamilton’s Shakespeare – Winter’s Tale – Act V, Scene III. 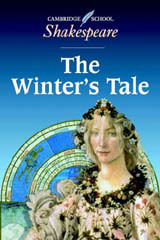 Cover image from the Cambridge University Press edition of Shakespeare’s The Winter’s Tale (ISBN 0521599555 £5.25 PBK).